Apple faces criticism for conditions on the iPhone production line. May 25, 2010: Apple opens an investigation into a string of suicides at Foxconn, its Chinese manufacturing partner. After reports of a ninth death at a Foxconn factory, Apple says it is “independently evaluating” Foxconn’s response. Cupertino vows to take a long, hard look at the facilities that manufacture its products. It’s a tough challenge for Apple to deal with — and Steve Jobs’ controversial comments don’t exactly help. 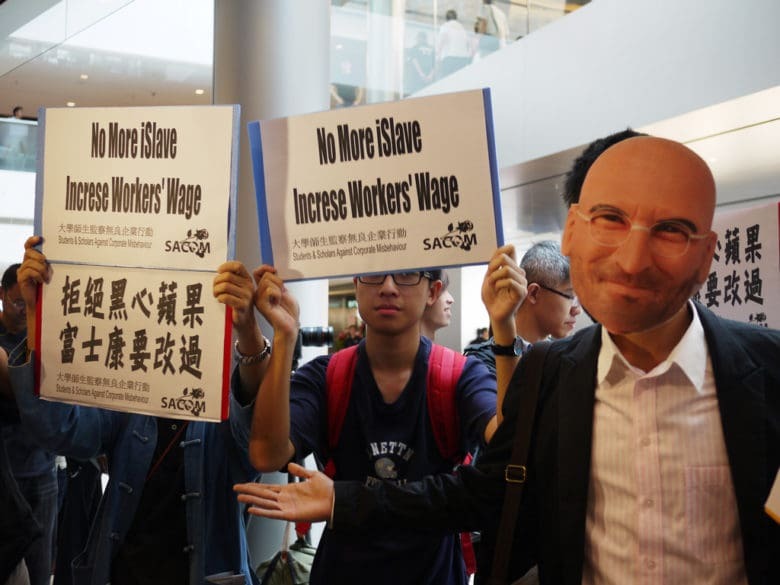 Working conditions at Foxconn rattled Apple during Jobs’ reign as CEO. The Chinese factories’ operations became one of Apple’s biggest controversies, alongside the iPhone 4 “Antennagate” problem, censorship in the App Store, Jobs’ backdated stock options, and Apple’s sometimes heavy-handed approach to the press. What all had in common was that they didn’t bring out the best in Jobs. He was a visionary leader, but could sometimes appear glib in public. That proved especially true when it came to dealing with issues he did not feel comfortable being challenged on. That’s what happened with the Foxconn suicides. In reality, Apple was far from the only tech company to make its products in China. However, its high level of visibility — and the fact that it successfully marketed itself as the freedom-fighting rebels motivated by making the world a better place — meant that it became synonymous with the news. This wasn’t helped by the report that one worker committed suicide after losing a prototype fourth-generation iPhone and subsequently being bullied by Foxconn security officers. Jobs was undisputedly brilliant when it came to selling products. But his brusque nature made his comments about the Foxconn situation come across badly. He defended Foxconn shortly after the suicide news broke, calling its factories “pretty nice” and “not a sweatshop” environment. The line that came over worst, however, was his comment that, “We’re all over this.” It struck many people as uncaring. In fact, Apple was all over the problem. After the suicide reports, it organized a task force to deal with the situation. The company quickly put measures into place to prevent the same thing from happening again. In the years since, Apple has worked to improve its supply chain, although it still faces occasional criticism from labor rights activists and other organizations. Apple CEO Tim Cook, meanwhile, has been the opposite of Jobs in a lot of ways. While not a product visionary, Cook has been far more outspoken about making Apple a “force for good” in the world. He doesn’t possess Jobs’ rough edges. Cook’s demeanor helps Apple navigate tricky terrain like working conditions in its supply chain.